The Goth girl with the vial of red liquid on her necklace. Whenever I see her, I tell myself “It's only grape juice…it's only grape juice….”. The taxidermist who has an unusual interest in my dog. Isn't it a bit morbid to measure the poor pooch? Phew – this slot's more about the first definition. I find them a lot less scary as they're more fantastical (It's not like you're likely to bump into Frankenstein in the parking garage on a dark stormy night). The Ghouls is a medium volatility 5 reel and 30 payline slot. The standard symbols are all cartoony visions of terror: a witch, mummy, Frankenstein, wolf, black cat, spider and ghoulish eye. The controls are a stylistic fit to the game which is refreshing. Up top, perched alongside an owl is your Paytable, while just below is the Progressive Jackpot display. Underneath the reels are your Credits, Bet, Win, Balance, Select Lines, Bet per line, Max bet, Spin and Choose coin. There is no Turbospin which is understandable, but perplexingly there's no Autoplay either. 3 or more bonus scatters anywhere activated the Bonus Game (More than 3 will mean that multipliers will be included in the game). 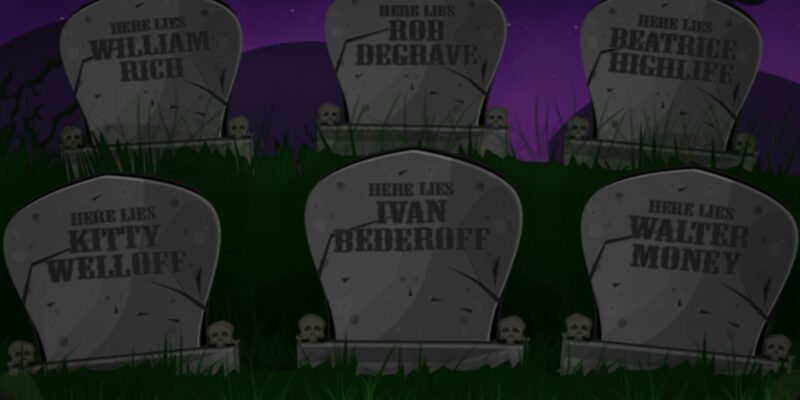 6 graves are presented on which you simply click to choose, revealing bonus winnings. After you've earned all your bonus wins, the round ends and you are paid out. When using Max Bet, 5 consecutive jackpot icons on an active payline wins you the Progressive Jackpot! The Ghouls can reward you with a maximum win of 500 000 coins! Full marks for the creepily humorous graphics and animations. The music was a tad too much like a fairground attraction, but the sound effects were spot on. With all 3 devices tested, The Ghouls presented no issues or problems. It's the freaky fun of The Ghouls which is so enjoyable and easy to love. I would have preferred an Autoplay and slightly higher RTP though. Nonetheless, this game had some great features and is a ton of fun to play!